Demonstrating the benefits of chiller refurbishment — a chiller serving the Woolverstone House office building in the west end of London. It is Murphy’s Law that when a vital piece of equipment breaks down it shall choose its moment to do so often at the most inconvenient time. However, as often such an event is foreseeable had appropriate steps been taken earlier. With older plant and for chillers this means that for equipment that was well built and appointed in the first place around 20 years is a reasonable service life expectation, with only periodic inspections required and an occasional minor repair, although most new equipment on the market today will likely never achieve 20 years’ service. But when it reaches its life point a replacement will likely be required, and here the wait begins. Table 1 shows the timeline for replacing a typical chiller — often after a period of much bother, expense and inconvenience of critical plant failure. From conception to completion can be more than six months, and the preliminary stage will, in most cases, take considerably longer than indicated in the table. 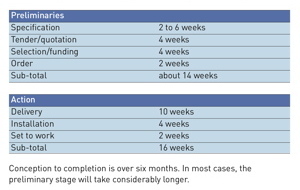 We have observed that even in situations of dire breakdown the preliminary stage will still take about four weeks before an order is issued, but often not much can be done to reduce the action stage further. 10 weeks delivery is 10 weeks delivery, and at peak demand time (late spring and early summer) can easily stretch to 12 weeks or even longer. 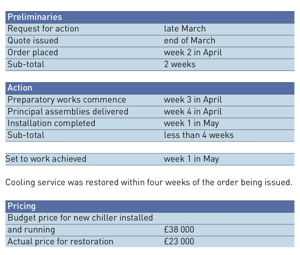 Table 2: Project timescale for replacing a Hitachi package chiller originally installed in 1991 at Woolverstone House. So at best that is an 22 week wait for service restoration, assuming no secondary delays are encountered. 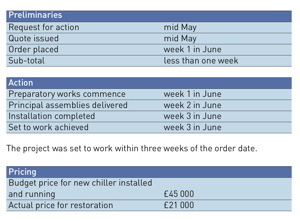 A refurbishment option using our ReChill refurbishment service can reduce much of the above process to as little as four or five weeks, as demonstrated by two actual projects (Tables 2 and 3). The chillers in both cases were 20+ years old and were restored to reliable service. Prior to considering the restoration option provided by ReChill, the only consideration was for new equipment; the compressors in particular were completely obsolete, and ancillary systems such as controls were in a dire state. Other significant benefits were also achieved in both cases. The original ESEER (European Seasonal Energy Efficiency Ratio) was estimated too, using R22 or a drop-in replacement. We left these chillers operating upon R134a with inverter screw compressors with an ESEER rating of 4.6 or better. That is over 50% lower energy requirement. Table 3: Project timescale for replacing a 200 kW Daikin water-cooled chiller originally installed in 1991 at the Royal Danish Embassy. The new chillers that were considered offered an ESEER of about 4. Improving the ESEER from 4 to 4.6 represents a life time operational energy saving of 13%. Within five years the entire projects will have been paid for from the energy savings achieved. Selecting R134a also provides an opportunity to retrofit later to a low-GWP non-flammable refrigerant as HFC phase-down proceeds. In both cases the new chillers that were being considered were R410A units for which no serviceable low-flammability low-GWP replacement has yet been developed. It is expected that R410A will suffer severe service shortages from 2018; specifiers take note! The works undertaken have been provided with a 2-year warranty, with service life expectation following the restoration of around 10 years’ further reliable service from these chillers, subject to ongoing PPM inspections. Both also benefit from remote service support via our RODEM (Remote Operating Diagnostic Energy Monitoring) system. Trevor Dann is a director of ThermOzone.